In order to make more space for car parking, the new Sainsbury's at Selly Oak is raised up on stilts. 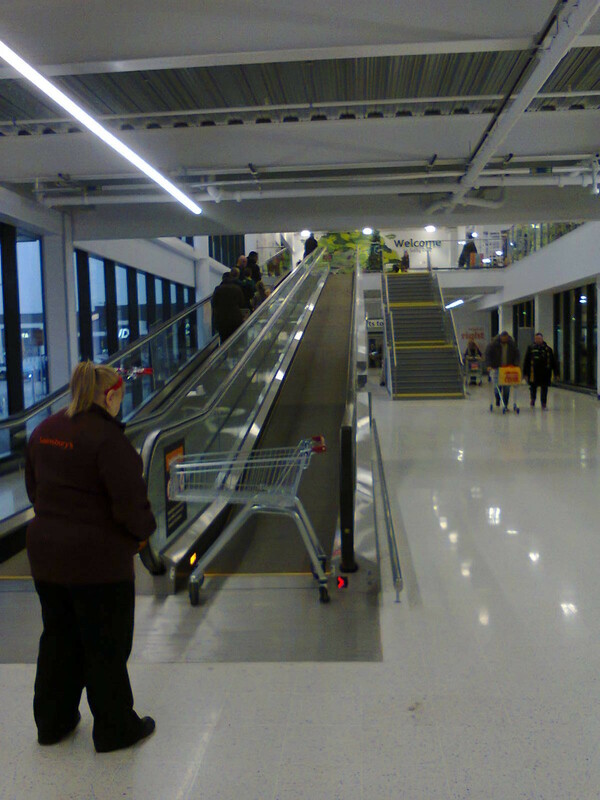 That means that rather than simply walking into the store (which took a few seconds at the old Sainsbury's), customers must choose between the stairs, the lifts, and the travelator. The stairs are an unattractive option if you have a disability that makes climbing stairs difficult, or arms laden with shopping, and completely useless if your shopping is in a trolley. The travelator is narrow, painfully slow, and regularly breaks down (as shown in the photo). The lifts are a long walk from the cycle stands. The travelator and lifts both burn their way through electricity (which is mostly generated using fossil fuel). All three render getting in and out of the store slow and inconvenient, though if you can manage them, the stairs are actually the fastest route. Selly Oak is supposed to be a Green Travel District, but this demonstrates how not to design for a Green Travel District. It is, however, classic automotive city design, as can be seen from visualisations from the 1950s.